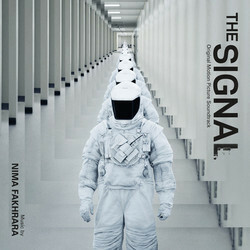 Dreamy, romantic countryside meets stylized, technological terror in The Signal, the new film from director William Eubank. Taking cues from cinematic masters such as Stanley Kubrick and David Lynch, The Signal follows a group of three friends who embark on a road trip, deep into the golden-hour wilderness. Lured off track by a computer genius, however, their summer haze soon turns into a living nightmare as they find themselves inexplicably lost in the midst of a sinister and dark world. For his second feature film, the experienced cinematographer Eubank continues on a similar visual theme to his previous work, evoking a distinct and carefully composed hell world. He has not scrimped on the musical front, either, employing experimental composer Nima Fakhrara to reflect the terror of his images, intensifying the characters’ trauma through his music. Iranian-born Fakhrara is no stranger to new and unconventional noises. Having focused on the nuances of Persian music during his studies, he has since looked at ethnomusicology, anthropology and instrument construction. With all of those strings to his bow, his trademark sound is often very experimental, unafraid to feature alternative scoring techniques and balance diverse textures. In fact, Fakhrara built three new instruments while writing The Signal’s score, exacerbating the strangeness of Eubank’s imagery through his equally weird music. Fakhrara’s modified percussive instruments are among the best things about the score. Teamed with a pulsing electronic bass line, the instruments sound ever so slightly off, as if the composer has tuned them a semitone higher than everything else. “Hallway Roll” spotlights the percussion particularly well, creating an offbeat contrast through the discordant pitching of the different instruments and their conflicting rhythmic drives. The music rapidly changes direction but not to the detriment of the overall work. In fact, the darting melodies move the piece along nicely, creating a sound that is both three dimensional and aurally rich. If there is a flaw in Fakhrara’s creation, it’s only in the fact that many of the cues are melodically repetitive. While indicative of a coherent whole, these tracks could have been bettered by a subtle change of instrumentation, or some variation on the soundtrack’s dominant melody. Melodic repetition is not enough to dampen the success of this music, however, and it is apparent that should Fakhrara continue in this same vein, he will only continue to produce great things. 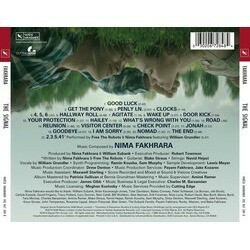 The otherworldly and mysterious score is by newcomer Nima Fakhrara.